Less Fee... More FREE with Sun East CHECKING! Plus Win a Direct Deposit Match up to $3,070! Less Fee… More FREE with Sun East Checking! Business and/or Association Checking Accounts not eligible for direct deposit match; please see official Anniversary Checking Sweepstakes rules at www.suneast.org/sweepstakes. 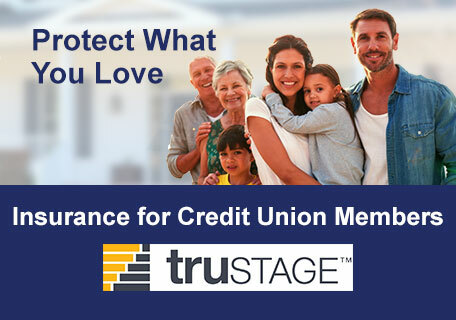 Other terms and conditions may apply; rates subject to change without notice; call 1-877-5-SUNEAST for details. Win 7 Loan Payments up to $700 in honor of Sun East’s 70th Anniversary! Home Equity Loan or Home Equity Line of Credit Official rules of eligibility for a chance to win 7 payments made up to $700 available at www.suneast.org/sweepstakes. All rates/terms subject to change without notice; other terms and conditions may apply; call 1-877-5-SUNEAST for details. Get up to $5,000	Buying Your First Home? Additional qualifications may apply; limited time offer, subject to end without notice. NMLS#433893	towards down payment and closing costs! Plus, earn a 10% Rebate on Agent’s Commission when you use the Sun East Realty Home Connection Program. 2.40% APY – 9 months	High-Yield IRA Certificate #1 2.40% Annual Percentage Yield (APY) as of 1/23/19; valid on new money only. Penalty for early withdrawals. After the initial term, certificate will renew automatically into the 12 month IRA certificate and earn the APY offered at that time. Limited time offer; rates/yields subject to change without notice. Other conditions/restrictions may apply; call 1-877-5-SUNEAST for details. Tax-deferred earnings with a Traditional IRA Certificate	High-Yield IRA Certificate #2 Consult a financial advisor or tax professional for guidance on tax-deferred or tax-free implications, allowable annual contributions, and required minimum distributions. Limited time offer; rates/yields subject to change without notice. Other conditions/restrictions may apply; call 1-877-5-SUNEAST for details. Tax-free earnings with a Roth IRA Certificate	High-Yield IRA Certificate #2 Consult a financial advisor or tax professional for guidance on tax-deferred or tax-free implications, allowable annual contributions, and required minimum distributions. Limited time offer; rates/yields subject to change without notice. Other conditions/restrictions may apply; call 1-877-5-SUNEAST for details. Guaranteed return on your investment	High-Yield IRA Certificate #2 Consult a financial advisor or tax professional for guidance on tax-deferred or tax-free implications, allowable annual contributions, and required minimum distributions. Limited time offer; rates/yields subject to change without notice. Other conditions/restrictions may apply; call 1-877-5-SUNEAST for details. Cash rebate up to $400! Finance Your New or Used Auto #1 Limited time offer. Subject to participating dealers. If loan is paid off in less than 90 days from loan date disbursement, Express Draft Cash Rebate amount will be added to payoff balance. Offer not applicable to existing Sun East loans. Call for competitive rates on other terms or vehicle model years. Limited time offer; subject to end without notice. Quick pre-approval and auto loan rates as low as 3.64%. 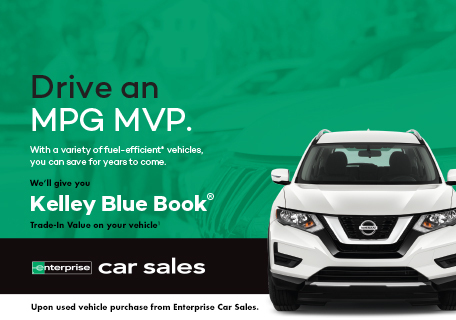 Finance Your New or Used Auto #2 Annual Percentage Rate; effective 2/12/19. APR for 2015 or newer for qualified buyers; cost per thousand is $14.95 based on a 75 month term. Loan/rate approval based on creditworthiness as well as other factors including but not limited to, term, amount requested and loan-to-value. 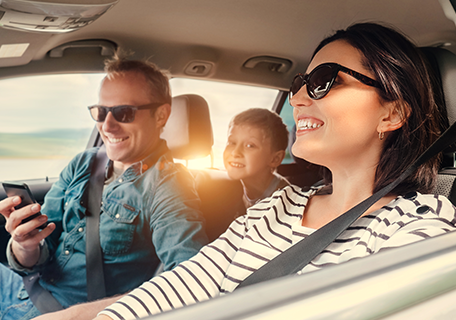 Rates are subject to change without notice and are not available to refinance existing Sun East auto loans or with other promotional offers. 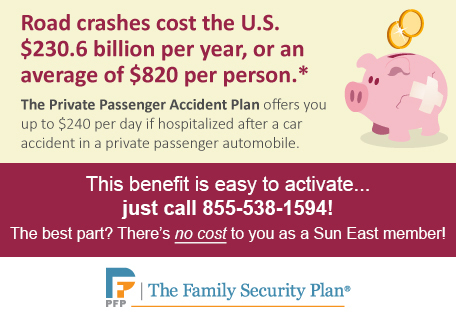 APR includes .25% discount for automatic payment transfer from Sun East Checking. If at any time, automatic payment transfer is discontinued then rate discount will be discontinued. Call for competitive rates on other terms or vehicle model years. Limited time offer; subject to end without notice. Start your financial journey with Sun East Federal Credit Union. Surcharge-Free Access To Your Money Almost Anywhere. Sun East Federal Credit Union has seven branches with drive-up ATMs conveniently located throughout southeast PA and north Delaware. Plus, we’re part of the Shared Branching Network with nearly 30,000 surcharge-free branches and ATM locations nationwide.